At a sideshow in a San Francisco fair in 1933, a boy, Will, who idolizes a legend known as the Lone Ranger, encounters Tonto, an elderlyComanche Native American Indian, who proceeds to recount his experiences with the Old West adventurer. In Colby, Texas on March 18, 1869, lawyer John Reid returns home via the uncompleted Transcontinental Railroad, managed by railroad tycoon Latham Cole. Unknown to Reid, the train is also carrying Tonto and outlaw Butch Cavendish, who is being transported for his hanging after being captured by Dan Reid, John's Texas Ranger brother. Cavendish's gang rescues Butch and derails the train. Tonto is jailed and Dan deputizes John as a Texas Ranger, and with six others, they go after the Cavendish gang. Cavendish's men ambush and kill their pursuers in a canyon and Cavendish cuts out and eats Dan's heart. Tonto, who has escaped from jail, comes across the dead men and buries them. However, a white spirit horse awakens John as a "spirit walker", and Tonto explains John cannot be killed in battle. Tonto also tells him Collins, one of the Rangers, betrayed Dan and is working with Cavendish, whom Tonto believes is a "wendigo". As John is thought to be dead, he wears a mask to protect his identity from enemies. Tonto gives John a silver bullet made from the fallen Rangers' badges and tells him to use it on Cavendish. At a brothel Collins recently visited, Red Harrington informs them about Dan and Collins' fight over a cursed silver rock. Meanwhile, Cavendish's men, disguised as Comanches, raid frontier settlements. John and Tonto arrive after raiders abduct Dan's widow and son, Rebecca and Danny. Regretting his earlier actions, Collins attempts to help Rebecca and Danny escape but is shot dead by Cole, who rescues them. Claiming the raiders are hostile Comanches, Cole announces the continued construction of the railroad and dispatches United States Cavalry Captain Jay Fuller to exterminate the Comanche. A Comanche tribe captures John and Tonto soon after the pair finds railroad tracks in Indian territory. The tribe leader tells John of Tonto's past: As a boy, Tonto had rescued Cavendish and Cole from near-death and showed them the location of a silver mine, in exchange for a pocket watch. The men murdered the tribe to keep the mine a secret, leaving Tonto with great guilt making himself believe that the men were possessed by evil spirits within the silver and vowed to find and kill them both. Finally watched this movie. I wasn't excited about it as the review wasn't great. The starting was really slow... drama-ish and dull. Thankfully, once John becomes the masked man, the funnies started. It was quietly hilarious, the badgering was spontaneous and it was excited until the end. 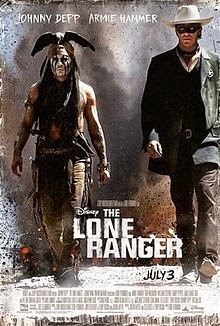 I guess many had high expectations for this movie especially since Lone Ranger is a legend itself.